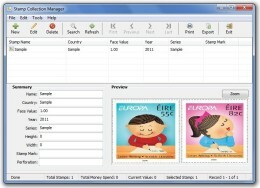 Easy to use 4 in 1 language utility which can translate text between 8 languages with 23 language sets, Find meanings of words, Read the contents of files and clipboard. It can also read the translations in its native language with proper accent using the in-built text-to-speech feature. 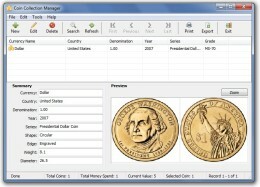 You can easily edit and saves your translations in multiple formats. Comes with 12 speech engines. 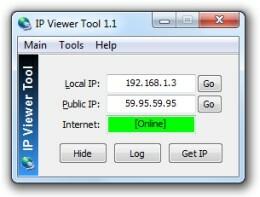 An antivirus solution for your USB Flash drive for protection against autorun.inf viruses. It provides future protection by immunizing the system by installing special autorun file which virus cant delete. Comes with multiple inbuilt tools like Task Manager to manage running programs, Autorun Suppressor to temporarily disable autorun. 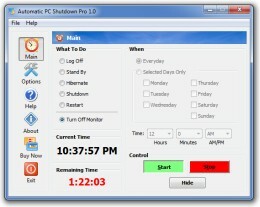 Easy to use application that allows you to automatically shutdown your PC at a specified time. It also allows you to reboot, hibernate, standby, log off, or turn off the monitor to save energy cost. 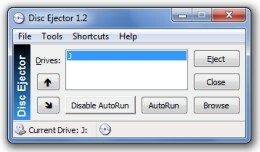 It gives you multiple options allowing you to choose when to set to shutdown your computer. A must have software for anyone who want to save on their electricity bills. Currency Converter FX is an easy to use financial utility that allows you to get latest currency exchange rates for more than 150 currencies. All rates are collected live from the internet so they are always current. It comes with an in-build calculator so you can quickly perform any calculations. 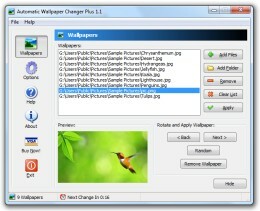 Automatic Wallpaper Changer Plus is a tool to automatically change your desktop wallpaper at specified intervals. You can select any number of images and even a folder containing images to be displayed as wallpaper, and set the time interval from every 3 minutes to 24 hours.